Did you know that a healthy mouth and a healthy heart go hand in hand? New research proves that your oral health and your overall health are more connected than we once thought. This connection is called the oral-systemic link and involves the study of how our systemic health affects our oral health and vice versa. Dentists and doctors specializing in the oral-systemic link estimate that half of all heart attacks are caused by gum disease. When 80% of the American adult population suffers from some level of gum disease, we can’t think of a better reason to start taking better care of your teeth and gums… today! We hate to sound like a broken record but, “Have you been brushing and flossing regularly?” Because oral hygiene really is the most important factor when it comes to your oral health. Yes, there are other factors involved including your diet, lifestyle habits, pH balance and genetic predisposition. However, poor oral hygiene is the root cause of almost all oral health problems. The good news is, your oral health is in your hands! You, combined with the skilled and compassionate care of your Hillsboro TX dentist, have the power to keep your smile clean and healthy for life. All you have to do is implement good oral hygiene into your daily routine, and come see us at Cowan Family Dentistry for your regular exams and cleanings. Now that you’ve implemented a stellar oral homecare routine, you’re ready to ace your next checkup. We will perform a comprehensive exam and update your x-rays if needed. At Cowan Family Dentistry, we’re proud to have one of the best oral hygiene teams in Hillsboro that will leave you with that fresh from the dentist clean feeling – without the sore gums! Brush at least twice a day, ideally before eating or drinking. Brushing immediately after eating can cause the acidity to damage your enamel. We recommend an electric toothbrush (Sonicare® is most recommended by dentists). Make sure to reach all the way to the back and brush the tongue. Rinse with water after eating and drinking to reduce plaque and decay by minimizing the time sugar and acid have in contact with your teeth. You heard right – 80% of the American adult population suffers from gum disease. When gum disease is the leading cause of tooth loss and may be a contributing factor for 50% of heart attacks, it’s time to start thinking about periodontal health. Gum disease is a bacterial infection of the gum tissue, largely caused by poor oral hygiene. Plaque that is allowed to remain on the teeth hardens into tartar, which irritates the gums to the point where they bleed and pull away from the teeth, or recede. 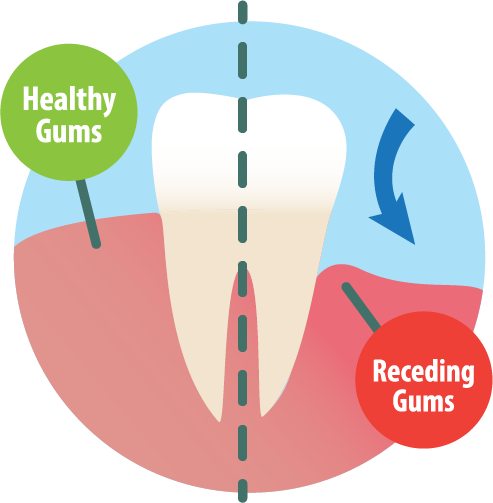 Eventually, gum recession turns into periodontal pockets, giving the bacteria a nice warm place to hide and multiply. Ultimately, enough gum tissue is lost that the teeth will become loose and fall out. As you may have already picked up, the consequences of gum disease go much deeper than just your mouth. Left untreated, gum disease can significantly increase your risk of heart attack, stroke, diabetes, Alzheimer’s, and many other serious systemic diseases. The bacteria associated with gum disease have a direct pathway to enter the body and wreak havoc on your overall health. The good news is, with diligent oral hygiene and regular visits to your Hillsboro, TX dentist, gum disease is not only treatable but preventable! If you’ve noticed any of the signs and symptoms of gingivitis or gum disease (bleeding gums), you should come in and see Dr. Cowan right away. Depending on the severity of your case, we can prescribe antibiotics to help control the infection, and recommend more regular deep periodontal cleaning appointments. More severe cases may need to be treated with laser therapy, tissue grafting or gum surgery. We offer gum recession treatment to help save the roots of your teeth from infection and to keep them from falling out. Gum recession treatment not only helps treat your gum disease but is also a cosmetic solution for gums that have receded. We take a small amount of tissue from the roof of your mouth and fix it to the gums so they reattach in a healthier position. Perio Protect® is a revolutionary long-term, minimally invasive, non-surgical gum disease treatment. In the past, the only way to treat gum disease was with regular cleaning of the root surfaces (scaling and root planing), which is still effective, but is temporary and be uncomfortable for the patient. Scaling and root planing requires maintenance every three months. In more advanced cases, surgery would be required. With these methods, we still see 80% of the American adult population with gum disease. Perio Protect® is a more comprehensive approach to gum disease treatment. This approach combines dental cleanings with an at-home tray and medication kit. Perio Trays® are custom designed with a special sealing system to deliver powerful medication below the gum line. Patients put the medication into the tray and wear it for a few minutes a day. This gives patients the power to take gum disease treatment into their own hands. If you’ve never had to have a cavity filled, you might be the only one. Most kids get cavities, and most adults will get one or more cavities as grownups, too. Cavities are nothing to be ashamed about, but that doesn’t mean you need a glaring reminder every time you open your mouth. Thankfully, with advances in modern dentistry and materials, we can now fill cavities with a natural looking tooth colored resin that blends in seamlessly with natural teeth. Tooth colored fillings, or composite fillings, are not only more attractive, they are also stronger and more durable to withstand biting forces, and won’t expand and contract with temperature changes like metal fillings do. Not to mention, they don’t use trace amounts of mercury, like metal fillings do, which has been found to be quite toxic to the human body. Tooth colored fillings safely and aesthetically fill cavities and stop tooth decay for a healthier, more attractive smile! As your oral health professionals, one of our most important jobs is to regularly screen our patients for oral cancer. Oral cancer is unfortunately on the rise in the United States, but the good news is, with early diagnosis and treatment, we can ensure your best chance of survival and recovery. That’s why your regular dental checkups are so important. We are always on the lookout for any abnormalities or changes in your mouth that may be a potential sign of oral cancer. If you’ve noticed any of the above signs and symptoms, or fall into any of the high-risk categories, you should come see us for an oral cancer screening today. It might just save your life. If you or your little one is involved in any type of contact sports, or you are one of many patients with bruxism (teeth grinding and clenching) or TMJ, you may benefit from a custom mouth guard from Cowan Family Dentistry. Oral sports injuries are unfortunately very common, especially for high contact sports like football, hockey, basketball, or rugby. While there are stock guards you can pick up at your local sporting goods store, only a custom mouth guard can offer the custom fit for the highest level of comfort and the best protection against tooth damage and concussions. If you are a patient that tends to clench and grind your teeth, like many of us do, a custom mouth guard can protect your smile from wearing down over the years and can minimize the pain and tension associated with the TMJ (jaw joint). A custom mouth guard is a simple investment that can protect your greatest asset – your beautiful smile – for years to come. If you have any questions about general dentistry or would like to schedule an appointment with your Hillsboro, TX dentist, Dr. Ryan Cowan at Cowan Family Dentistry, give us a call today at (254) 582-9555 or schedule a visit online!